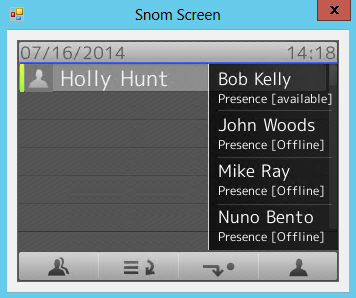 Note: Also see my Lync Snom Configuration Manager Post for more Snom related fun. 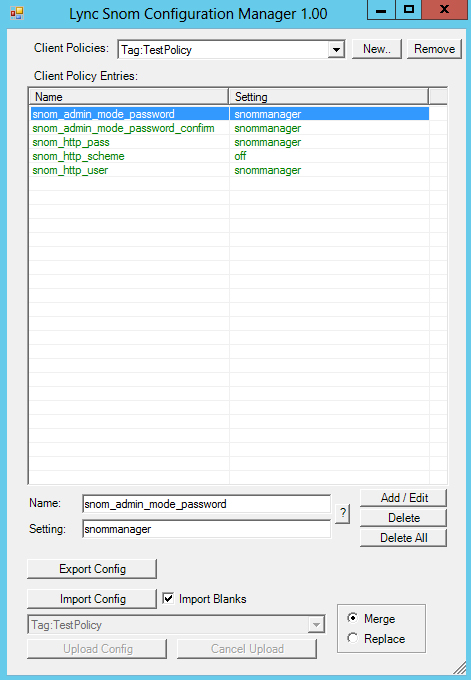 The Lync Snom Manager has the ability to query the Lync Monitoring database (if you have one deployed) and find all the IP Addresses of Snom phones connected to your Lync server. It will then scan all the IP Addresses of Snom phones supplied by the Monitoring database using a fast multi-threaded discovery method to connect to and learn about all the Snom devices on the system. If you do not have a Lync Monitoring Database you can simply type an IP Range (format: "192.168.0.1-192.168.0.20" OR "192.168.0.0/24" OR add multiple with comma separation "192.168.0.0/24,192.168.1.0/24") into the listbox and press the "Discover from IP Range" button. The tool will then scan the phones using a fast multi-threaded discovery method to see if they are at each IP address in the range. If a Snom handset that is not logged in as a user is discovered, it will be added to the user list under the name “SnomNot@LoggedIn_<index number>”. This allows you to use the tool to access these devices even though they are not logged into Lync. Find out information about Snom handsets connected to a Lync system (IP Address, the Lync server that the handset is registered to, user policies, PIN status). Remotely reboot Snom handsets using the "Reboot" button. Reboot a selection of handsets by selecting (hold shift/ctrl) multiple users in the list, then press the ‘Reboot’ button. Or reboot all the Snom handsets on a Lync system with the “Reboot All” button. Remotely set a Snom phone's configuration back to factory default settings by pressing the "Reset" button. To be safe. you will be warned before this function is actually completed. Set the PIN for a user - either a random PIN (if the PIN field is left blank), or specify a PIN number by filling in the field. This can also be done on multiple selected users. Lock and unlock the PIN for a selected user with the "Lock PIN" and "Unlock PIN" buttons. This can also be done for multiple selected users. Easily connect to the Snom phone web interface of any user on the system by clicking the “Web Config” Button. Test PIN and device bootstrapping by entering a PIN number for the selected user and pressing the "Test PIN" button. Export your Snom phone deployment information. This outputs a CSV file that contains all the Users, IPs, Firmware Version, Serial Numbers, Lync Server, and MAC Address (if available) for all logged in phones. If you select the "More" checkbox you will also get the additional Lync settings for the phone (this is slower). Import previously exported phone data. This allows you to import previously exported phone data, which can save you time “Pinging” IP address ranges looking for phones. The “Rescan” option will make the Snom Phone Manager tool connect to each device in the imported list and update its information. This is to help try and avoid importing stale data with incorrect IP Addresses in it. If you trust that your phone IP Addresses have not changed from when you previously exported the data, you can untick the “Rescan” option, and all settings will be imported directly from the file (much faster but less safe). Variable for https connections to the Snom web interface. Change the variable $script:useHTTPS to be $true if you would like all web interface connections to use https instead of http. This will also require that you change the $script:WebPort variable to be "443" as well (or whatever port you set in the configuration file for https). These settings can also be added in a settings file if you don't want to edit the script. Added support for common area phones. The Display Name is also shown as part of the User Information section in order to make Common Area Phone identification easier. When the script runs it will look for the settings file and parse it into the appropriate variables. #Edit these settings if you would like to use a custom username and password for your Snom devices. In order to discover phones from the Monitoring database (this is not required for the IP range discovery method), the user logged into the server will need to be a Domain Admin or have “Select” privileges granted on the LscCDR database's Registration table for a security group they are a member of (eg. CSAdministrator). For more details on how to grant these privileges, please refer to the manual process in my article about Group Call Pickup permissions here. Note: the database and table being edited in this case are different than the ones documented in the article, but the process is the same.